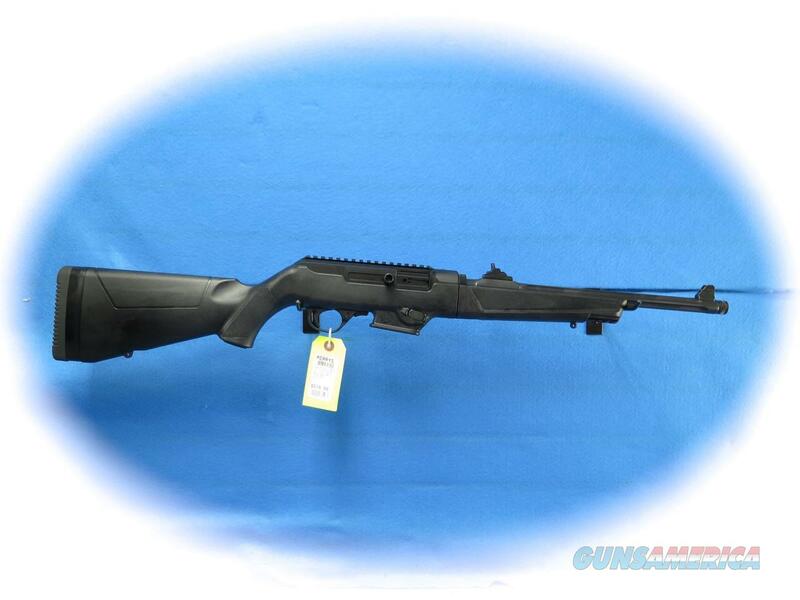 Description: Ruger PC Carbine 9mm semi auto carbine, Model 19100. Interchangeable magazine wells for use of common Ruger® and Glock® magazines. Ships with SR-Series Pistol and Security-9® magazine well installed and an additional magazine well accepting Glock® magazines is included*. Easy takedown enables quick separation of the barrel/forend assembly from the action for ease of transportation and storage. Takedown is as simple as locking the bolt back and verifying that the rifle is unloaded, pushing a recessed lever, twisting the subassemblies and pulling them apart. ambidextrous use or one-handed control manipulation while maintaining a proper firing grip*. Cold hammer-forged, chrome-moly steel barrel with ultra-precise rifling provides exceptional accuracy, longevity and easy cleaning. The heavy contour barrel provides consistent accuracy, while barrel fluting sheds unnecessary weight and allows for quick handling. 1/2"-28 threaded barrel with included thread protector allows for use of standard muzzle accessories. Accurate sighting system with adjustable ghost ring rear aperture sight and non-glare, protected blade front sight. Soft rubber buttpad with spacers allows the rifle to be properly sized for different shooters or varying levels of outerwear or defensive gear (three, 1/2'' spacers included). Durable, glass-filled nylon synthetic stock features sling swivel studs for rapid sling attachment and forward mounted accessory rail to allow for a variety of under-barrel accessories such as lights or lasers. The grip features a proprietary texture for enhanced control. Light, crisp trigger pull with minimal overtravel and positive reset utilizing proven 10/22® trigger components. CNC-milled from an aerospace-grade 7075-T6 aluminum billet, the receiver includes an integrated Picatinny rail and is Type III hard-coat anodized for maximum durability.